We owe @BeardedGenius a debt of gratitude for this incredible picture. The big story over the weekend in the Premier League was Alan Pardew’s headbutt on David Meyler during Newcastle’s 4-1 away win at Hull on Saturday. Newcastle have since fined their manager a whopping £100,000 as well as issuing him with a formal warning for his bad behaviour, however many on the outside feel that the whole incident has been blown out of proportion. 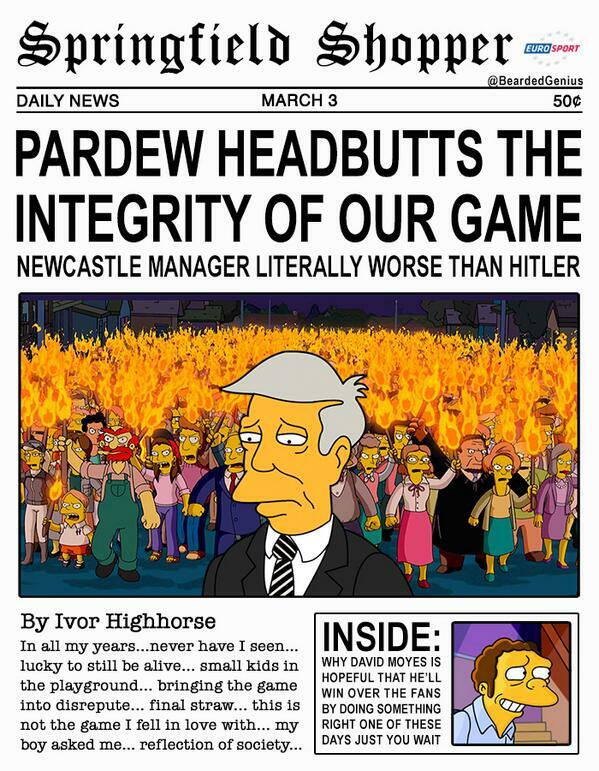 Looking to inject some much need light-heartedness into the mix, @BeardedGenius has gone about creating a spoof newspaper front page in which the Pardew story has been given the Simpson’s treatment. The joke at David Moyes’ expense in the bottom right hand corner is just an extra added bonus.